As a follow-on to the "Planning Integrated Signal Communications" story, this article is the next step in the U.S. Army Signal Corps' implementation of ubiquitous communications systems. Along with powerful transmitters and super-sensitive receivers at command communications hubs are the many hand-held, back-pack, and vehicular radios needed to complete strategic and tactical operations across the face of the Earth. It wasn't just wireless systems that Signal Corps engineers and technicians were responsible for, but also all the wired equipment and interconnecting cabling. The possibility of software configuration for network switches, radios, modems, telephones, antennas, and ancillary components had never been thought of in 1950 (by very few, anyway). Everything was set up with patch panels, jumpers, and hard-wired connections. That's not to say modern communications are any easier to implement - just much different. Born in Illinois in 1896. Attended University of Illinois 1914-17. Entered Officers' training in 1917. Went overseas in 1918 and from 1919 to the out-break of second World War attended various Army training schools and held diversified commands. Served as Signal Officer for 9th Army Corps in Panama at beginning of World War II and subsequently saw service in the Caribbean Defense Command and in the China-Burma-India theater. He served as signal officer for the 6th Army in 1946-47. He became Chief of the Engineering and Technical Division in the Office of Chief Signal Officer in September 1947, a post he still holds. Top-flight engineers, military and civilian, work as a team to produce the world's finest communications equipment for our Armed Forces. 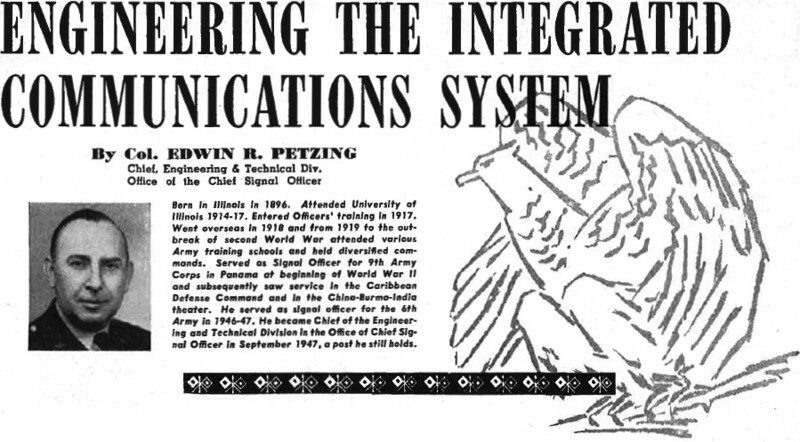 The integrated communications system planning discussed in "Planning Integrated Signal Communications" of this issue resulted, shortly after World War II, in concrete requirements for the individual items of equipment necessary to form the global, theater, and combat communications networks. 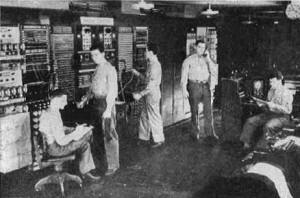 To bring the integrated concept into being, the Signal Corps established at its Signal Corps Engineering Laboratories in Fort Monmouth, New Jersey, a major program of research and development designed to furnish the fighting forces with the best and most efficient military communications equipment in the world, integrated into a system providing the maximum speed and flexibility needed for future warfare. System-wise, the development plans have taken into consideration the increasing complexity of warfare; the increasing need for inter-arm and inter-service communications; and the wider bands needed for larger numbers of communications channels or for newer forms of communications. Equipment-wise, the plans have emphasized the requirement that all communications equipment for our modern army be light, rugged, and operable in hot, cold, dry, or rainy weather. Logistics-wise, due consideration has been given to engineering for mass production, maximum use of common components and subassemblies, and application of the "building block" principle. 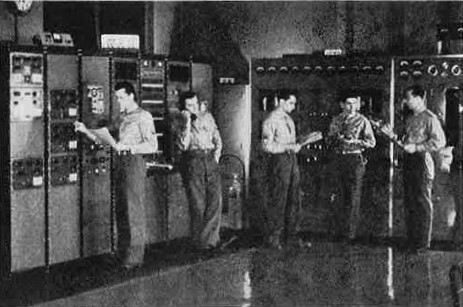 Successful accomplishment of a plan as ambitious as that outlined above would require many times the facilities and manpower available to the Signal Corps in its own laboratories. But, by means of contracts with industry and educational institutions, the best communications brains and the best facilities in the country have been obtained to aid the Signal Corps in translating the many equipment requirements into the tangible hardware needed to form the system. Military development in peacetime must, of necessity, be geared to limited budgets and limited manpower and, consequently, is spread out over a considerable time period. However, emphasis on communications developments has resulted in many equipments of the integrated system being completed and placed in production. Most of the remainder are advanced to a point where production will be started this fiscal year. Army Communications Center in Pentagon, shows patch board and coordinating and receiving consoles. Teletype loop jacks are provided at patch board to connect spare receiving equipment to incoming circuits in case of trouble. Board is also used with associated printer equipment (left) in order to communicate directly with distant station to correct discrepancies in messages. Console in foreground is used as a coordinating point between traffic terminating section and radio control section (not shown). Console's operator decides whether a circuit is operable or requires action by some other section to correct troubles. Receiving consoles in background are where messages are received in tape form and, if necessary, are transferred to relaying equipment for further transmission. The chart shown in Planning Integrated Signal Communications illustrates the general concept of the integrated communications system and depicts the general use of the various types of equipment in the system. The following discussion of the individual equipments will cover the main developments in radio and wire illustrated on the chart. One of the main communications requirements of lower echelon combat commanders has long been a series of hand-held, back-pack, and vehicular radios designed to give efficient command communications and at the same time provide channels for use between Infantry, Armor, and Artillery. World War II equipment was not adequate for the job; handie-talkie set were amplitude modulated; walkie-talkies were FM, and vehicular sets using FM were provided only for Armor and Artillery. The postwar sets, on which development has now been completed and production started, provide many advantages. For example, the handle-talkie, a 1- to 3-mile set is now FM and can communicate with other appropriate sets in the group. While it is about the same size as its AM predecessor, it represents significant progress in miniaturization in that a 14-tube FM circuit has been packaged in the same space formerly required for a 5-tube AM set. The walkie-talkie, a 3- to 5-mile set, has been designed in three frequency bands to match the bands of the vehicular sets of the Armor, Artillery, and Infantry with overlaps to allow communication between them. While power output has been slightly increased, size and weight have been reduced by one-half. Particularly important to the man in the front line is the 50 percent reduction in thickness which makes the set much less conspicuous when carried on the back. The vehicular sets, composed of three basic assemblies to cover separate frequency bands with overlaps, provide 10- to 20-mile FM voice communications for the Infantry, Armor, and Artillery. In addition to the basic transceiver, a separate short range transceiver is provided which will communicate with the handie-talkie, one of the walkie-talkies, one of the basic transceivers and all of the other short range transceivers in this vehicular group. To obtain added range and flexibility, provisions are included for retransmission from the basic transceiver to the short range transceiver and vice versa. In addition, where 20- to 40- mile FM voice ranges are needed. a back-to-back type relay set is provided. It is interesting to note that the use of crystal saver sets in the vehicular series has resulted in a requirement of 11 to 21 crystals per set versus a comparable requirement of 80 to 120 in the World War II series. Main control board in the transmitter room of the Army Communications Center. In the foreground at left are shown the 72" racks which are equipped with Press Wireless radio teletype shifters. These units are used as exciters to each transmitter and the output is fed through a coaxial antenna system to the oscillator of the transmitter. Center foreground is the main control panel which is the nerve center between the transmitting station and message center. The 15 kw. 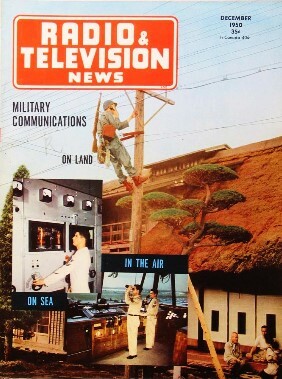 transmitter used for transmissions on overseas circuits is in right front. Experience with the limited number of equipments available toward the end of the past war indicated that radio relay was a most promising means of communications as a substitute for and augmentation of wire systems, and that it was ideal for radio-wire integration. In general, World War II equipment was not used below division headquarters level and when used in rear areas did not provide an adequate number of channels per set. Consequently, the development program has been directed toward providing three types of relay systems: forward area, intermediate area, and rear area. With three relays, ranges up to 50 miles are possible on the forward area relay system. The transmission accommodates a relatively broadband signal and, with carrier equipment discussed later in this article, will give four voice channels, each of which can, in turn, provide up to eight teleprinter channels. Since use down to regimental level is contemplated, the terminal station, complete with associated carrier equipment, has been designed to fit into a vehicle of the three-quarter-ton weapons carrier type. Intermediate area radio relay equipment will be under procurement before the end of the fiscal year in the form of a system with adequate band­width for 12 voice channels or the equivalent in facsimile, data transmission, or teleprinter channels. The same 12-channel carrier terminals being developed for wire systems will be utilized. Primary employment is contemplated for main-line communications from Army to Corps, and from Corps to Division. To meet rear area requirements, development has been pointed toward 48- to 96-channel relay systems with ultimate ranges up to 1500 miles. Due cognizance has been given to engineering features necessary to assure the capability of satisfactory transmission of television and wide-band facsimile. While the equipment has reached the engineering model stage and tests have been satisfactory, it will probably not be ready for production this year. To provide a usable system in a shorter time, a modified version utilizing time division multiplex to obtain 24 channels is being placed in production in the next few months. Primary use will be for communications from Theater to Army Group to Army, and for providing main line circuits within the communications zone. The addition of FM and radio relay principles to the military radio system has not by any means reduced the necessity for conventional AM systems in certain applications. It is obvious, for example, that FM with its short range in the frequencies used - and radio relay systems with their dependence on relays for range - would be of little use to an airborne division landed 100 miles behind the enemy lines. Mobile communications over intermediate ranges also obviously point toward AM sets. Global networks covering distances up to 12,000 miles must, of necessity, continue to utilize frequencies suitable for long ranges and methods of modulation giving maximum frequency conservation. The main development being pursued currently in the low power AM field is a 100-watt set for use by lower echelons within divisions and by airborne troops. Ruggedness, reliability, small size, and simplicity are the keynotes that have governed the development. Quantity production is expected to start within the near future. Since the transmitter and receiver sites are widely separated. a centralized control point is used, all radio circuits are coordinated and associated and the transmitted and received signals carried through the radio control switchboard to the terminating equipment used in sending and receiving the message traffic. The radio control operators carry out their coordinating work with distant stations both overseas and domestic by voice or teletype printers. In planning development to satisfy requirements for sets working over ranges calling for wattages from 500 to 50,000 the Signal Corps has proceeded on the "building block" principle utilizing the 500-watt transmitter as the basic component. Addition of a 5 kw. power amplifier provides a set suitable for military communications in the 1000- to 2000-mile range, while the addition of a 50 kw. amplifier and necessary auxiliary equipment leads to a high-powered system for use on a global basis. Provisions are made for teleprinter, facsimile, voice, and c.w. transmission. Accessory equipment is provided for single sideband adaptation. In addition, parallel development is proceeding on a simplified single sideband transmitter. Within a few months production on 500 and 5000-watt sets will be under way. Receivers for the above equipment will be taken from a general receiver family being developed to fit communications, intercept, and direction finder roles. While the above equipments have been discussed as individual items, it must be emphasized that they are developed within the concept of an integrated system and that devices for radio-wire integration are either integral to the equipment or furnished as auxiliary items. Wire systems are still considered in general to be the backbone of most Army communications despite the improvements being made in the radio field. Consequently, postwar effort on development of wire equipment has paralleled the effort on radio systems and is producing comparable results as will be indicated. One of the really significant advancements now paying off in Korea and elsewhere is the new Signal Corps field wire which has been developed to replace both the well-known W-110-B field wire and the W-130 type assault wire of the past war. No rubber is contained in the new wire and substantial reductions have been made in other strategic materials. While W-110-B wire weighed around 140 pounds per mile, the new wire weighs only 48 and has an increased talking range, better abrasion and moisture resistance, and longer life. To facilitate wire laying, a new canvas wire dispenser has been perfected which allows high- or low-speed wire payout from the inside of the package without the use of reels or axles. Besides the obvious advantages, particularly to the forward area wire layers, a considerable saving in metal reels is realized. Also" nearly developed is a lighter and tougher spiral four field cable for use with 4- and 12-channel carrier systems. The basic cable for both systems is identical physically and electrically, with loading for 4-channel operation being accomplished by insertion of a small weatherproof loading coil between cable connectors. Radio control panels where all signals can be checked, switched, and measured. The panel on the left is for radio frequency patching, sometimes called switching. The next two panels are "audio" patching panels and the emergency two-way PM communications position to the Communications Center. The trick chief's duties are monitoring and keeping all circuits and two-way communications normal before reception at the center. The system of switchboards contemplated for the integrated system provides capacities required from battalion to theater level and utilizes, when possible, the "building block" system. Just going into production is a 12-line mono cord board of the magneto type weighing about 22 pounds versus the 72 pounds of its predecessor and utilizing retractable cords. Capable of stacking up to three units, this board will be suitable for use up to regimental level. Also soon to be available for use at regimental and divisional level is a 30-line magneto board of the more conventional type capable of 60- to 90-line expansion and using many of the basic components of the smaller board. For use where larger capacities are necessary, a common battery board, based on a 70-line position and capable of expansion up to 2000 lines, is being developed. For ease and speed of installation, this board is equipped with plug-in type cables for interconnection between positions, and between main frame and switchboard. As with all Army equipment, the ability to stand the bumps and adverse weather conditions inherent in military operations has been built into the equipment. The Signal Corps' main contribution to the teleprinter field is the development of a simplified page printer weighing only 45 pounds, usable at speeds from 60 to 100 words-per-minute, and designed specifically for ruggedness and dependability and ease of maintenance. 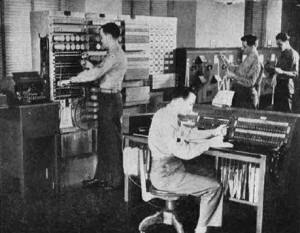 Due primarily to its 225 pound weight, and multitudinous parts the teleprinter previously standard for the Army was not suitable for use in lower units, whereas the new unit with only one-fifth the weight and 300 fewer parts will allow teleprinter service to be employed down to the regimental level. A 17-pound tape printer now in development will further extend the use of this most desirable means of communications to battalion level. Recently completed voice frequency line units for use with these two equipments will allow the utilization of radio voice channels on tactical radios for teleprinter service. Of comparable importance, the voice frequency principle will make possible the use of teleprinters over local subscriber telephone circuits and through standard telephone switchboards. Commercial telephone and telegraph carrier equipment is designed for fixed station operations under controlled conditions where size, weight, and ruggedness are not determining factors. The Army requirements for carrier equipment include lightweight, small equipment built to take rough usage, and operate with little attention under adverse weather conditions and over communications lines subject to considerable electrical variations. To fill this need three carrier systems are currently under development, a 4- channel telephone carrier, a 12-channel telephone carrier, and a 48-channel system. A new 8-channel telegraph terminal can be used as needed in conjunction with any of the above terminals. The terminal equipment of each of the above systems will be used not only in the 4-, 12-, and 48-channel wire sets but also with the 4-, 12- and 48-channel radio relay equipment. Commercial standards for transmission levels and quality are being closely followed in development of such equipment so that long distance communications over the integrated communications network will approximate, insofar as practical, that found in American commercial systems. Any brief article dealing primarily with the results of development in the communication field has the danger of leaving the reader with the impression that a completely short-range program is being pursued. Such is certainly not the case. 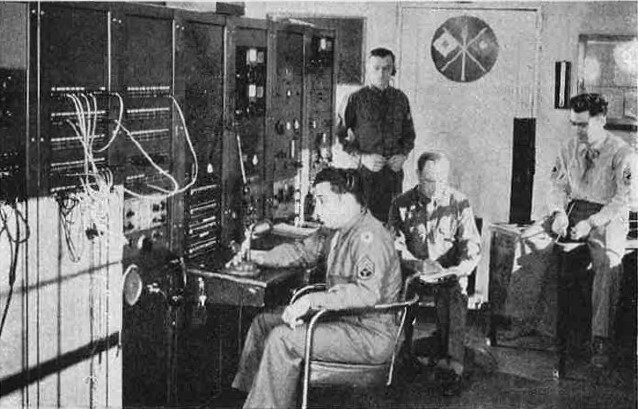 The Signal Corps maintains at its own laboratories, and sponsors in the laboratories of universities and industry, a long-range program of research and development having as its objective the constant search for new basic knowledge, principles, techniques, and materials; and their application to the Integrated Communications System. By continuing a vigorous, long-range effort, the Signal Corps expects always to provide the best military communications in the world.